The Michigan Data Collaborative (MDC) is a non-profit healthcare data organization at the University of Michigan. 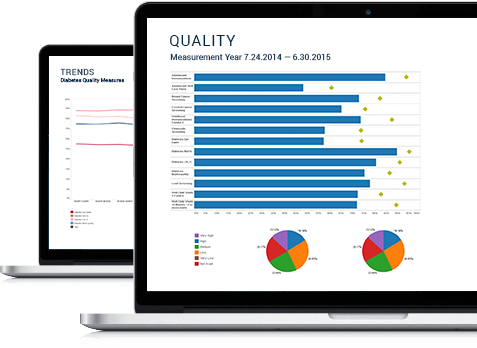 We support care delivery transformation initiatives across the state of Michigan by providing solutions for data collection, aggregation and visualization, measure calculation, and reporting. The PGIP PO Services page features an overview of our PGIP-related services as well as customer support information. The SIM PCMH page provides information about the reports, measures, data management, and delivery solutions we are providing for the PCMH Initiative, which is part of the State Innovation Model (SIM) and builds on the foundation of MiPCT. The CHIR page provides information, news, and support documentation for the SIM PCMH CHIR Dashboard. The CPC+ page provides information about our deliverables supporting the CPC+ project. The MiPCT page provides project information, news, and support documentation for the MiPCT demonstration period, which ended on December 31, 2016. Copyright © 2019 Michigan Data Collaborative. All rights reserved.